This luxurious foot moisturizer is designed to smooth and soften rough, dry, and cracked feet. Formulated without the use of parabens, Atopalm Moisturizing Foot and Heel Balm is able to restore beauty and comfort to overworked feet. Using MLE technology, the skin’s natural moisture barrier is restored, leaving the feet feeling perfectly hydrated, smooth, and comfortable. Atopalm Moisturizing Foot and Heel Balm is a lightweight yet rich moisturizing balm designed to hydrate, smooth, and soothe the feet and heels. Paraben-free and formulated with Atopalm’s exclusive MLE technology, Moisturizing Foot and Heel Balm is able to restore distressed, dry skin, leaving the feet and heels with a healthier and more youthful texture. Atopalm Moisturizing Foot and Heel Balm is clinically proven to soften and smooth feet after five to ten days of proper use. This is achieved using plant-derived ingredients found in Atopalm’s MLE technology, which work together to replenish the skin’s natural oils and moisture barrier. In addition to MLE, this foot cream also contains olive oil and extracts of grape seed, portulaca oleracea, and eucalyptus to reduce redness and discomfort while rejuvenating the entire foot area. This product is the best foot lotion and works as a superior cream for cracked heels and dry heels. A unique, lightweight, non-greasy, paraben and fragrance free balm with US Patented Multi Lamellar Emulsion technology containing phytosterols and other plant derived ingredients, bolstered by natural oils and extracts including Eucalyptus Leaf Oil to soothe, cool and refresh. Moisturizing Foot and Heel Balm, serious treatment for the most overworked and under appreciated parts of the body. Helps eliminate dryness and unsightly cracking on feet and heels. MLE technology mimics the structure of natural skin lipids and aids in the restoration of the skins’ protective moisture barrier while helping to prevent over evaporation of the skins’ own moisture. Independent clinical studies showed the balm helped reduce dryness and cracked skin within 5 to 10 days of continuous use. A true blending of technical and traditional. Moisturizing Foot and Heel Balm is an ideal product for everyone to use, men, women and even on children, to help eliminate the discomfort of dry, cracked feet and heels. Perfect for all skin types, but especially good for dry, extra-dry and sensitive skin. Daily after shower or bath. Apply liberally from toes to ankles, massaging into skin until totally absorbed. Pay special attention to extra-dry, cracked areas. Can be used as often as necessary. After 5 days a visible difference was perceived between the left foot that had the balm applied and the right foot that did not. The left foot looked smoother and felt softer. The left foot, after 10 days, showed a definite softness and showed no indications of dry, white and cracked heels as was apparent with the right foot which was not treated. Unique, lightweight and non-greasy with the wonderfully fresh aroma of Eucalyptus Leaf Oil. Serious treatment for the overworked and under appreciated feet! 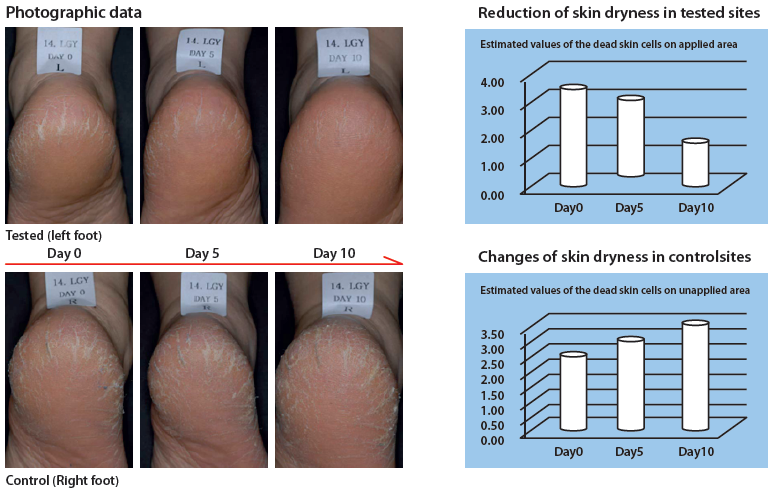 Testing proved that it helps eliminate dryness and unsightly cracking on feet and heels. Use daily after shower or bath. AQUA, GLYCERIN, UREA, MYRISTOYL/PALMITOYL OXOSTEARAMIDE/ARACHAMIDE MEA, SORBITAN STEARATE, OLEA EUROPAEA (OLIVE) FRUIT OIL, HYDROGENATED VEGETABLE OIL, CETEARYL ALCOHOL, GLYCERYL STEARATE, VITIS VINIFERA (GRAPE) SEED OIL, CAMELLIA SINENSIS SEED OIL, DIMETHICONE, PORTULACA OLERACEA EXTRACT, 1,2-HEXANEDIOL, CAPRYLYL GLYCOL, TROPOLONE, PHYTOSTEROLS, POTASSIUM SORBATE, ARGININE, CARBOMER, EUCALYPTUS GLOBULUS LEAF OIL, STEARIC ACID. Best heel and foot cream available! Over the past three or four years, I tried what seems like everything to moisturize the dry and very sensitive skin of my feet. I'd just about given up and resigned myself to having chronically dry, cracked feet. Then fortunately I discovered Atopalm Foot Balm. It works wonderfully, and also leaves the feet feeling refreshed. I highly recommend this great product. I use this foot cream right after the shower and my feet are no longer dry and cracked. Great product~ I definitely recommend. I have had a persistent callous on my foot for years. I tried this cream along with a pumice stone, and the callous is almost completely gone. My feet are soft all over for the first time, and the eucalyptus oil gives a very calming scent that makes me feel like I've been to a spa. Highly recommended.